A Guest Post by Jolanta Gustafsson. randomly, you can get quite a cheeky look! 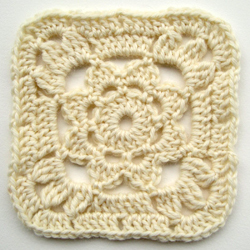 Note: Squares in the photo are joined with single crochet stitches. 3trbb (3 treble bobble) – *yarn over hook twice, insert hook in designated stitch, yarn over hook and draw it through stitch, (yarn over hook and draw it through 2 loops on hook) 2 times, repeat from * 2 more times, yarn over hook and draw it through all 4 loops on hook. 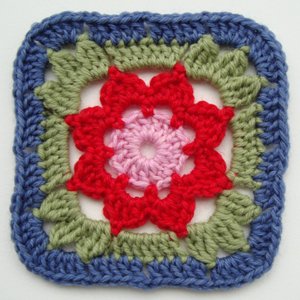 Note: The pattern is written using 4 colors (color A, B, C, and D), if crocheting using only one color, please ignore the instructions for changing colors. If you need help with changing colors, please see the tutorial How to Change Colors in Crochet. Jolanta is a teacher, a knitter, a crocheter, and an eager Crochet Spot visitor from Finland. This entry was posted on Sunday, November 11th, 2012 at 12:00 AM by A Guest Writer	and is filed under Free Crochet Patterns. You can follow any responses to this entry through the RSS 2.0 feed. You can skip to the end and leave a response. Pinging is currently not allowed. Beautiful color choices! Thanks for submitting this post! The one colour version is great! Hi, Rachell! The pattern is written in USA terms. I’m glad you liked the one colour version! 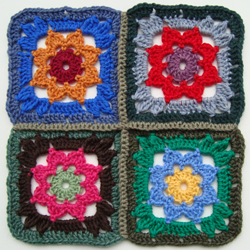 I started making squares to put together for an afghan a year or two ago – finding different pretty squares to join together. I’ve not worked on it in the longest time – it is sitting in my closet. I’m going to make a selection of these in different colors and put them with the other designs in my afghan. Thank you for sharing. It is beautiful! Thank you for sharing this pretty pattern. This would be a great stash buster, I have lots of half used skeins to use up. Thank you for this beautiful pattern. The end of round four is very confusing. Can you clarify? Thank you for this pattern. I was looking for beautiful squares to make my first sampler afghan. Round 5 uses the term trbb, but I can’t find the explanation for anywhere. Right above the start of the pattern there is a special abbreviations section. There you’ll see the explanation for the trbb. I need to find out if it is ok to change this up just a little bit. I did 3puffs and chained3 spuffs in row four. I could not get the hang of the sts you did. thank you very much for the easy follow pattern tutorial. I already tried and shared the result on my blog. Even it is in Turkish, you see the picture of what I’ve done. I do plan a blanket for my niece as a birthday gift. Thank you so much. Is there another option also – say a crochet way? I have been teaching myself through websites and videos. I learned the basics and more…However, I seem to get stuck with most patterns as the explanation not so clear. I just finished above pattern. It looks so lovely. You explained it so well and made it so simple. Thank you so much. Thank you so much for this darling pattern. I’ve discovered how to crochet via YouTube videos and this is my very first pattern I’ve ever tried to follow, and the first time changing colors (I used your link for that). The pattern has been wonderful to follow and I’m thrilled by the result of my first square. Congrats Maren, on learning to crochet, reading the pattern, And doing a color change! I see lots of crocheting in your future. Enjoy! Hi! Your beautiful square is the first non-granny that I’ve tried. It looks pretty, but where you have pointy star shapes, I have rounded petal shapes (round 3). Trying to figure out what I did wrong (beside crocheting much too loosley!). The pattern was easy to follow. Can’t wait to try more!! Thank you so much for this pattern, but I am completely stuck on round 4. I just finished single crocheting my last row of chains into the space I initially slip stitched in round 3. Now what do I do? I am very confused. This section of the pattern is quite hard to understand. Maybe this is because I am not a native speaker?? but I see other comments saying the exact same thing. The “sc in same st as third sl st on round (work over the sl st and next ch st), sl st in ch-6 space” means to make a single crochet into the same stitch (on round 3) that the third slip stitch is made into. In doing so you will work over that third slip stitch and into the chain stitch. Then you will make a slip stitch into the ch-6 space. Let me know if it is still confusing and I can try and help you further! I know I’m late to the game, but i am very confused about what the instructions want me to do at the end of row 2. Can I get help please? “sc in same dc as first sl st (work over the sl st and next ch st)” means that you are to work into the same double crochet that you made the first slip stitch into at the beginning. When you make the single crochet stitch it will end up overlapping the slip stitch and the next chain stitch.